Thanks to its gorgeous design, the Mexican Silver Libertad has become one of the world’s most beloved coins. 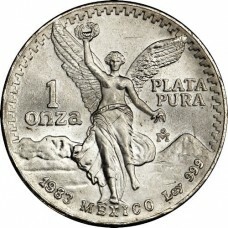 Its obverse displays a winged image of Victoria atop the Mexican Independence Victory Column. Behind her are the famed mountains of Popocatépetl and Iztaccihuatl. On the reverse, the current Mexican coat of arms is surrounded by historical coats of arms from the past. The Libertad’s design is beautifully executed with intricate engraving and superb eye appeal. Contains 5 troy ounces of .999 fine silver. Minted by the Casa de Moneda de Mexico (Mexican mint) which was founded in 1535. It is the oldest mint in North America. All of our Libertads are fresh coins from an authorized Casa de Moneda de Mexico distributor. Best Prices on 5 Oz Mexican Silver Libertads!